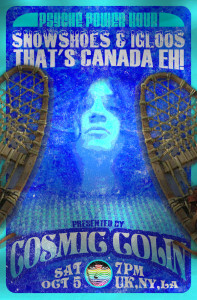 October 5, Psychedelicized Power Hour, Cosmic Colin Presents Snowshoes & Igloos: That’s Canada Eh! Ok everyone, it’s time to dig out those winter coats and gloves, and join us this Saturday for the latest edition of the Psychedelicized Power Hour, Snowshoes & Igloos: That’s Canada Eh! Join me, Cosmic Colin, on a trip through the Great White North, the country that I call home, Canada. Featured will be some of Canada’s greatest psych music. So lets turn up the heat and enjoy some northern entertainment. Show times are 7 PM UK, NY, and LA. P.S. It isn’t always cold or snowy in Canada!